The story begins in 1879. Cheval, then 43 years old, had been working as a rural mail carrier in the southeast of France for 12 years. Because his daily routine involved walking about 20 miles (32km), mostly in solitude, he did a lot of daydreaming. One day (perhaps while his mind was elsewhere), he tripped over a small limestone rock. 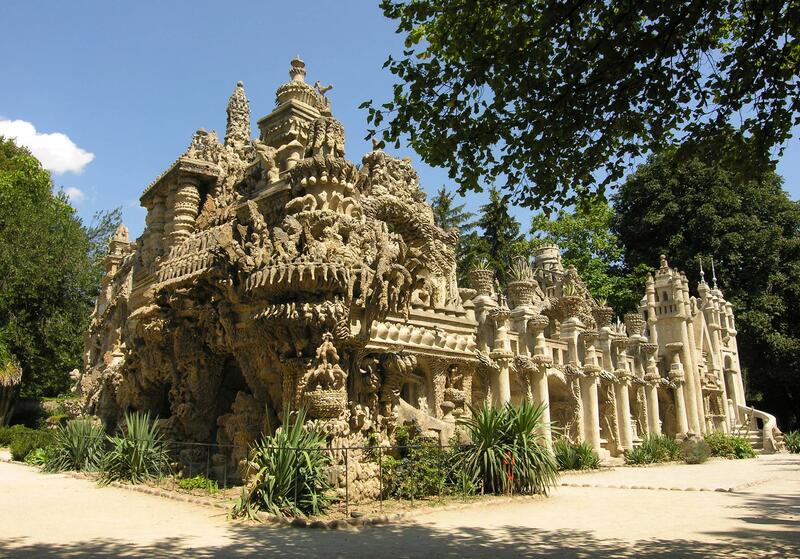 He picked up that stone and over the next 33 years went on to build his dream, Le Palais Idéal, an amazing fantasy palace. "Whatever your age, whatever your wish to achieve, if you are courageous, persistent and hard-working, you are sure to succeed." Unusual travel destinations: Poorly educated with no knowledge of architecture let alone engineering, he gave birth to a surreal place of fantasy art. Awesome, I have to go visit! It's between Lyon and Valence. I got to visit Salvation Mountain a few years ago and meet its builder, Leonard Knight. It's more of an explicitly religious vision than Cheval's Palais, but intensely personal. What struck me most is how modest Leonard was. It's like he put all his ego into his construction. See also The Coral Castle. There should be a name for these kinds of monumental structures painstakingly constructed by a single man over a long period of time. He's quite famous in France, and his name is often mentionned as one considers a very complex and idiosyncratic work : "C'est le palais du facteur cheval !" Really want to visit Coral Castle one of these days. Tucks "C'est le palais du facteur cheval !" in my memory pocket, to be used on the right occasion. Wikipedia term: It is regarded as an extraordinary example of naïve art architecture. That's great. Reminds me of La Maison Picassiette. That sounds so...deprecating, though. I feel like that term downplays these people's vision, however inexpertly that vision may at times be realized. Even the term "outsider art" sounds better to my ear. I get why we have trained architects, engineers, and contractors plan out most buildings and structures—it's usually safer, for one thing—but when it's art, I feel like respect should be paid. Also worth a look is Nek Chand's Rock Garden, in Chandigarh. MeFi term: magnificent obsession. It came into vouge on October 4th, 2001, 6 people used it for the first time that day, stated by grumblebee in a magnificent obsession FPP, and took off from there. Oooh, that's a good term! Thanks stbalbach. Don't forget the Castle in Versailles Kentucky (now renamed CastlePost after its new owner). List of castles in the United States. Dunno if there are any decent ones. People should build stone buildings like Cheval that are both tasteful and original. Influenced by the past but not imitations of it. the Place looks like giant Sand Castle. mainly the shade of colours. I've always been partial to Dementia Concretia. Wow, incredible! I wish I had known about this when I visited Provence--it would have been a neat day trip from Aix or Avignon. Like various' link to La Maison Picassiette, this reminds me of Antoni Gaudi's work in Barcelona. Unlike the rest of us, who simply toss them out of our way. Yes! Dementia Concretia was the term I was thinking of! I knew I'd seen it before!